Residential Services with Advanced Aire Flow Inc.
Is there anything more soothing than being comfortable in your own home? Your home is likely the most important and most expensive investment that you will make in your lifetime. I understand the importance of keeping your home comfortable. To make it a place where you can relax and have some leisure time and melt away the stresses of the day in a pleasant environment. If it too hot or too cold, that takes away the comfort you expect and are entitled to in your own home. That is where Advanced Aire Flow, Inc. comes in. To solve the problem. It is likely that the air conditioning unit or the furnace (depending on what season it is), may not be running at peak efficiency. First, let us talk about your HVAC system. If it is not running effectively, because of dirt, dust, worn parts, rust or anything that causes inefficiency, then you should have it serviced. Chances are your A/C, furnace or ductwork is working harder and not effectively cooling or heating your home. This can result in higher utility bills because the unit is running more and working harder and your not getting the same effect. Upon arrival at your home, I will assess the problem and give you a full estimate and outline all of your options. In any service call, you want fast, efficient, and quality service. You want the best service for a fair price. Only then, does the service have true value. Advanced Aire Flow does quality repairs at a fair price. When your A/C unit is “down” in this climate it can be a nightmare and you and your family are living is discomfort. My mission is to get you back in your “comfort zone” as soon as possible. Likely you will know when your unit is not performing up to it's peak. You know this because your utility bills may be higher and your not as cool. But sometimes a complete failure is unplanned. You may not have control over an A/C unit that isn't working, but you do have control over who you get to fix it. Just as the heat can be excessive during the summertime months, the winter can bring cold. It is not sub-zero cold like in the Dakota's or Minnesota, but it does get cold enough so that the inside of the home is very uncomfortable. You can rest assured that Advanced is only a phone call away. 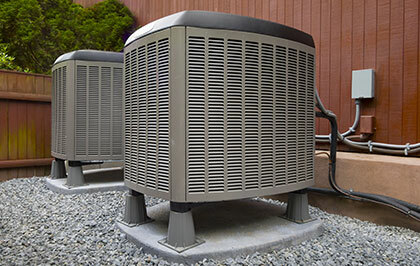 If your old air conditioner has had multiple problems costing you money for service calls too often, or if a full diagnostic indicates multiple failures, it sometimes makes better sense to install a whole new unit. If it's determined that purchasing a new unit is in your best interests, I will make every effort to install a unit that would suit your needs. Air conditioning units have become far more efficient than those that were put in you build or purchased your home and can save you money in the long run. When a new efficient air conditioner is installed, you will notice the difference in your home and in your utility bill. You deserve the best air conditioner, furnace and ductwork, and you want and deserve to have it expertly installed and maintained. The newer units are able to run with less electricity and cool you home more effectively. It is the best of both worlds: more cooling effect with less electric bill! There are a number of businesses that will try to “sell you up” or take advantage of you at a time like this and try to sell you a new unit or repairs that you don't need because you are in such a vulnerable position. Fair play is not just a lofty precept to Advanced, but it is a principle that we strive to bring to all of our customers with fairness, honesty and integrity. I am trained to understand your home's cooling and heating system no matter of the make or model. I will not only make sure your system is running again but will stabilize it to achieve maximum performance. Advanced takes a great deal of pride on being so well trained. Any installation requires a great deal of expertise and close attention to detail. We take into consideration the amount of space that needs to be cooled and will figure out what is the best unit for you. We will not sell or install a unit that is too big or too small. We make friends with most of our customers because of the quality work, the fast efficient service and the fairness in price. It is of utmost importance to keep all of the component parts of any system properly maintained. The A/C, the furnace and the ventilation system all have to be in top shape to avoid your entire system from running ineffectively and having a lot of heat or cooling escape without bringing anybody any comfort whatsoever. At Advanced, I would like to set you up with a routine maintenance program. On a regular basis I will come to your home and clean, repair (if needed) and maintain your system to sustain it in good working order. Proper maintenance can extend the life of the unit(s) and keep repair or replacement to a minimum. On any brand new project where a furnace, air conditioner or ductwork has to be installed in new construction before a family moves in, Advanced can be your expert. In a new construction where the ductwork hasn't been installed yet, Advanced Aire Flow can use it's expertise in placing the furnace, air conditioner and ductwork where it will do the most good and heat and cool efficiently. So, for any new construction call Advanced Aire Flow for fair pricing and expertise so you can run your home efficiently.